As I was working on e-mails one night, thinking to myself, “Hmmmm … I wonder what kind of fun stuff I’ll be sharing with my friends on Simply Real Moms next?” I heard the gasp of inspiration come from my husband. Yep. Come on. If you’re a parent, you have been through this. Most likely, you’ve been through this MULTIPLE times. Lucky for us, this is the first time Miles has colored on the wall. Unfortunately, it was a SHARPIE. This is something I’ve been dealing with a lot lately. The little girl I nanny for has gotten herself into a lot of trouble by leaving her gang signs and tagged wording around the house. 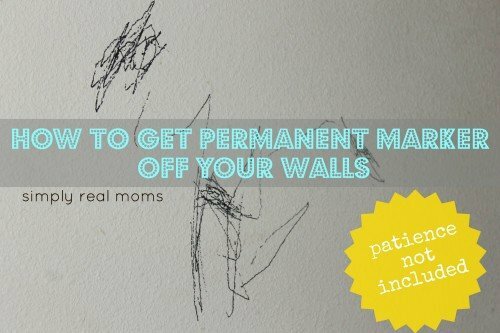 On the walls, on her bedspread, all over her play kitchen, toys, cds, furniture … EVERYTHING. She tried to deny it at first, but like any little hoodlum she tagged her name each time to leave her mark. Caught. So I’ve been *trying* to clean up the messes with different products, only ending up taking the paint off the walls! 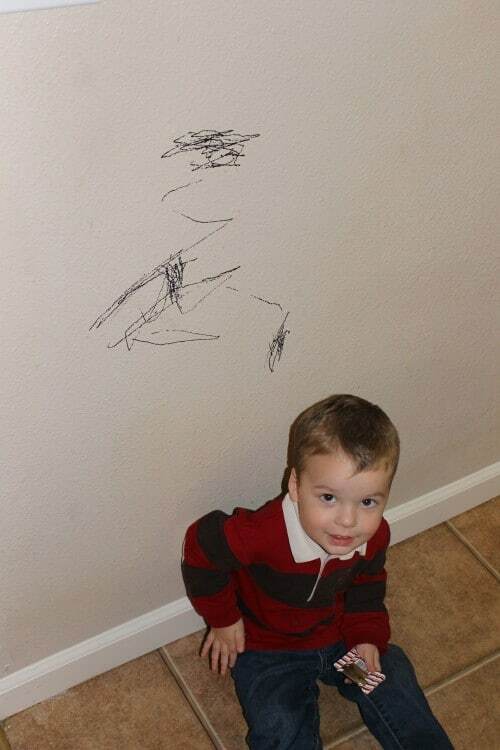 But when I saw that permanent marker on my kitchen wall, I jumped to action. After dealing with this in the past, I have a few tips. Mr. Clean Magic Erasers! Amazing! They get everything off … including your paint. Steer clear of these for marker on your walls. Soap and Water? Eh. Works for marker of the washable variety, but is there REALLY a washable marker? REALLY?! But tonight, I gave myself a high five. For reals. Don’t judge. 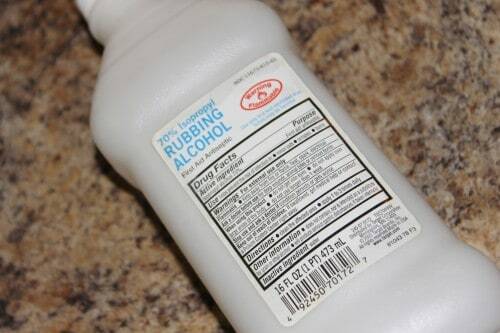 I soaked a rag with rubbing alcohol and lightly rubbed the wall in a circular motion. And it came off! It took some time, and for each little section I had to re-soak (the alcohol evaporates quick!) but it came off almost completely! 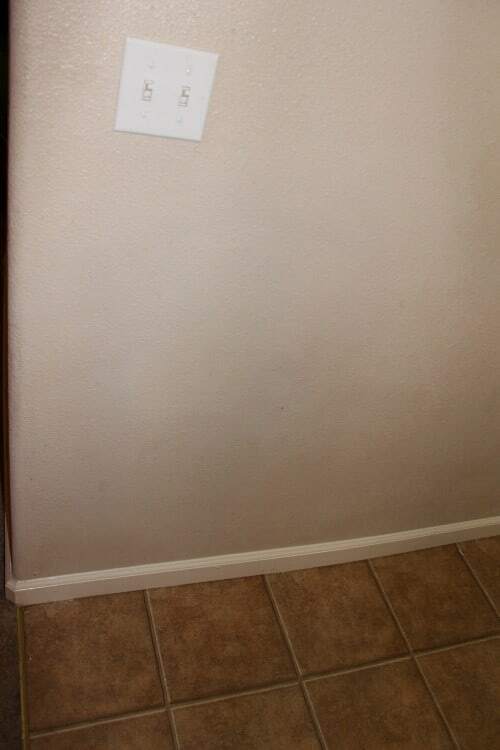 There was still a slight discoloration in some of the nooks and crannies of our textured walls, but once the wall dried up, I went back over it with a new alcohol soaked rag and it was gone. Make sure you REALLY soak that rag, and just be careful not to rub too hard. I did rub a bit more aggressively in some of the stubborn spots, but just keep your eye on the paint situation. Now, if your little hoodlum has made their mark on some clothing or material of some sort, use (no kidding) aerosol hairspray! Really soak that work of art with the hairspray, then rub the clothing (or bedspread or your curtains) together, really scrubbing the hairspray into the fabric. Wash as usual, and it comes out! I have seen this miracle happen on old marker, so nothing is too far gone, my friends. So. Lesson learned. Keep rubbing alcohol in the house, and keep stools far away from where your hubby leaves his sharpies. Great idea! Lemon juice AND lemon essential oil also works so so so well. Thanks, going to try this soon to see if it works on the stuff we couldn’t get off a few months ago.